Titus 2:11-15 (NASB)11 For the grace of God has appeared, [a]bringing salvation to all men, 12 [b]instructing us to deny ungodliness and worldly desires and to live sensibly, righteously and godly in the present age, 13 looking for the blessed hope and the appearing of the glory of [c]our great God and Savior, Christ Jesus, 14 who gave Himself for us to redeem us from every lawless deed, and to purify for Himself a people for His own possession, zealous for good deeds. 15 These things speak and exhort and reprove with all [d]authority. Let no one disregard you. Intro: Grace is defined as the “underserved love and favor of God toward fallen man.”It’s defined as divine influence upon the heart, and its reflection on life”. When you take a moment and consider all that that means, it is an awesome thought! It means that any sinner can be saved! Any storm can be weathered. Any situation can be faced. When we sing Amazing Grace, we are telling the truth. This passage is one of the clearest in the Bible on grace and its results. 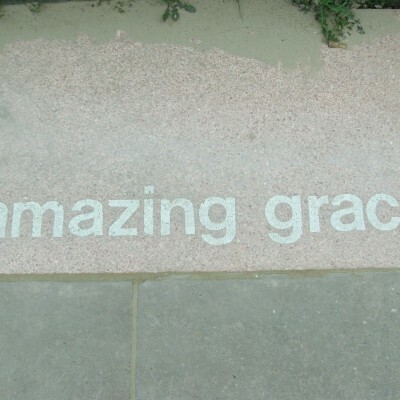 Notice three facts about God’s amazing grace. Ephesians 2:8-98 For by grace you have been saved through faith; and [a]that not of yourselves, it is the gift of God; 9 not as a result of works, so that no one may boast. 1 John 1:6-9 says’6 If we say that we have fellowship with Him and yet walk in the darkness, we lie and do not practice the truth; 7 but if we walk in the Light as He Himself is in the Light, we have fellowship with one another, and the blood of Jesus His Son cleanses us from all sin. 8 If we say that we have no sin, we are deceiving ourselves and the truth is not in us. 9 If we confess our sins, He is faithful and righteous to forgive us our sins and to cleanse us from all unrighteousness. Galatians 3:12-1412 [a]However, the Law is not [b]of faith; on the contrary, “He who practices them shall live [c]by them.” 13 Christ redeemed us from the curse of the Law, having become a curse for us—for it is written, “Cursed is everyone who hangs on a [d]tree”— 14 in order that in Christ Jesus the blessing of Abraham might [e]come to the Gentiles, so that we would receive the promise of the Spirit through faith. 1 Peter 1:17-2517 And if you call upon Him as [your] Father Who judges each one impartially according to what he does, [then] you should conduct yourselves with true reverence throughout the time of your temporary residence [on the earth, whether long or short]. 18 You must know (recognize) that you were redeemed (ransomed) from the useless (fruitless) way of living inherited by tradition from [your] forefathers, not with corruptible things [such as] silver and gold,19 But [you were purchased] with the precious blood of Christ (the Messiah), like that of a [sacrificial] lamb without blemish or spot. 2. Salvation means we are delivered eternally from the penalty of sin – Rom. 6:23 23 For the wages of sin is death, but the gift of God is eternal life in[a] Christ Jesus our Lord. 14 “Do not let your heart be troubled; [a]believe in God, believe also in Me. 2 In My Father’s house are many dwelling places; if it were not so, I would have told you; for I go to prepare a place for you. 3 If I go and prepare a place for you, I will come again and receive you to Myself, that where I am, there you may be also. 2Cor. 5:6-8 Amp. ;5 Now He Who has fashioned us [preparing and making us fit] for this very thing is God, Who also has given us the [Holy] Spirit as a guarantee [of the fulfillment of His promise]. 26 And whoever continues to live and believes in (has faith in, cleaves to, and relies on) Me shall never [actually] die at all. Do you believe this? C. But your Question is do you know Jesus? Yes, there is a saving grace of God! But only if we know Jesus as Lord and Saviour! · The necessity of the New Birth Is that we know Christ and that we Believe He is the Son of God! Spiritual birth can only come through Grace and Faith that we believe, HE IS WHO HE SAID HE IS!! John 3:16 16 “For God so loved the world, that He gave His [a]only begotten Son, that whoever believes in Him shall not perish, but have eternal life. · John 6:47 Truly, truly, I say to you, he who believes has eternal life. Rom. 10:9-10 9 That if thou shalt confess with thy mouth the Lord Jesus, and shalt believe in thine heart that God hath raised him from the dead, thou shalt be saved. II. GRACE SCHOOLS US: (Teaches Christian Living) Titus 2:12 tells us Grace is instructing us…..
A. Grace teaches the negative side of Christian living: What to avoid! 1Cor.10:3131 Whether, then, you eat or drink or whatever you do, do all to the glory of God. 4-6 You’re cheating on God. If all you want is your own way, flirting with the world every chance you get, you end up enemies of God and his way. And do you suppose God doesn’t care? The proverb has it that “he’s a fiercely jealous lover.” And what he gives in love is far better than anything else you’ll find. It’s common knowledge that “God goes against the willful proud; God gives grace to the willing humble. B. Grace also teaches us what to do and how we should live on the positive side of life! Our Motive should be changing – Mt. 5:16 16 Let your light shine before men in such a way that they may see your good works, and glorify your Father who is in heaven. 2. Grace instructs us that we should be living Righteously with others: – Rom. 12:17-2117 Never pay back evil for evil to anyone. [a]Respect what is right in the sight of all men. 18 If possible, so far as it depends on you, be at peace with all men. 19 Never take your own revenge, beloved, but [b]leave room for the wrath of God, for it is written, “Vengeance is Mine, I will repay,” says the Lord. 20 “But if your enemy is hungry, feed him, and if he is thirsty, give him a drink; for in so doing you will heap burning coals on his head.” 21 Do not be overcome by evil, but overcome evil with good. Col 3:15-17 15 Let the peace of Christ [a]rule in your hearts, to which [b]indeed you were called in one body; and [c]be thankful. 16 Let the word of [d]Christ richly dwell within you, [e]with all wisdom teaching and admonishing [f]one another with psalms and hymns and spiritual songs, singing [g]with thankfulness in your hearts to God. 17 Whatever you do in word or deed, do all in the name of the Lord Jesus, giving thanks through Him to God the Father. Grace will teach us how to live on the positive side of Christianity and what to do! Romans 5:1-4 says Therefore, having been justified by faith, we have[a] peace with God through our Lord Jesus Christ, 2 through whom also we have access by faith into this grace in which we stand, and rejoice in hope of the glory of God. 3 And not only that, but we also glory in tribulations, knowing that tribulation produces perseverance; 4 and perseverance, character; and character, hope. A. Grace Causes us to look for Christ in everyday life and His promise that He will come again! Jesus is coming! John 14:1-3 “Do not let your heart be troubled; [a]believe in God, believe also in Me. 2 In My Father’s house are many dwelling places; if it were not so, I would have told you; for I go to prepare a place for you. 3 If I go and prepare a place for you, I will come again and receive you to Myself, that where I am, there you may be also. 1Thes 4:13-1813 But we do not want you to be uninformed, brethren, about those who are asleep, so that you will not grieve as do the rest who have no hope. 14 For if we believe that Jesus died and rose again, even so God will bring with Him those who have fallen asleep [a]in Jesus. 15 For this we say to you by the word of the Lord, that we who are alive [b]and remain until the coming of the Lord, will not precede those who have fallen asleep. 16 For the Lord Himself will descend from heaven with a [c]shout, with the voice of the archangel and with the trumpet of God, and the dead in Christ will rise first. 17 Then we who are alive [d]and remain will be caught up together with them in the clouds to meet the Lord in the air, and so we shall always be with the Lord. 18 Therefore comfort one another with these words. 1 John 3:1-3 See what great love the Father has lavished on us, that we should be called children of God! And that is what we are! The reason the world does not know us is that it did not know him. 2 Dear friends, now we are children of God, and what we will be has not yet been made known. But we know that when Christ appears,[a] we shall be like him, for we shall see him as he is. 3 All who have this hope in him purify themselves, just as he is pure. Mt. 24:44 44 For this reason you also must be ready; for the Son of Man is coming at an hour when you do not think He will. B. Grace Causes us to be a peculiar people- Set apart from the world even though we live in it! (A people for His own possession) 1 Cor. 6:19-20 19 Or do you not know that your body is a [a]temple of the Holy Spirit who is in you, whom you have from [b]God, and that you are not your own? 20 For you have been bought with a price: therefore glorify God in your body. This Relationship also gives Hope Right Now!!! Phil. 4:19 19 And my God will supply [a]all your needs according to His riches in glory in Christ Jesus. Eph. 2:8-108 For by grace you have been saved through faith; and [a]that not of yourselves, it is the gift of God; 9 not as a result of works, so that no one may boast. 10 For we are His workmanship, created in Christ Jesus for good works, which God prepared beforehand so that we would walk in them. James 2:17-18 17 Even so faith, if it has no works, is [a]dead, being by itself.18 But someone [b]may well say, “You have faith and I have works; show me your faith without the works, and I will show you my faith by my works. The devil says you’re a failure! But grace says I can do all things through Christ! The devil says your guilty and your might as well give up…. But grace says there is therefore no condemnation for those who are in Christ Jesus!!! Jesus said on the cross It is finished!! !